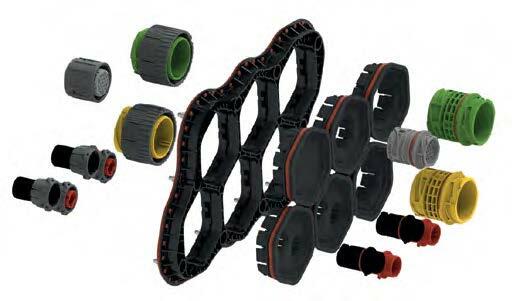 APD is a versatile range of full plastic direct, in-line and bulkhead connectors that comply with ISO 15170. The series covers a wide range of 1 and 2-way power solutions up to 51-way interface connectors, special sensor or PCB type versions and a flexible platform for your customized solutions. Enables quick and simple management of APD connectors in cabin to chassis and centralized interconnect applications. Mating, un-mating, reconfiguring or adding cabin to chassis and centralized interconnects on the production line can be a complex, time consuming and costly exercise. In some instances the cabin can be removed from the chassis several times during the assembly process. In order to solve this issue ITT Cannon’s engineers developed the innovative and patented Modular APD Interface that ensure installing, reconfiguring, mating and un-mating of Cannon’s class leading APD interconnects is simple, fast and pain free.